The first California sparkling wine I ever tried that I loved was from Roederer Estate, and coming from a guy with a Champagne palate that is a large statement. I've been a fan since, and they just may be my favorite California Sparkling wine producer. Perhaps that is no surprise, as Roederer Estate is owned by the superlative Champagne Louis Roederer, makers of Cristal and other wonderful Champagnes. They are located in the Anderson Valley, 125 miles north of San Francisco near the coast and although their first wine shipped in 1988, they have been cultivating vineyards and preparing since 1982 on the 580 acre property. Obviously they have the financial backing to do things the way they think they should be, and the quality shows. They have complete ownership of their vines, not buying any grapes at all, and only use the first pressing of juice from only Pinot Noir and Chardonnay Grapes. In addition, they add older reserve wines they age in oak casks, adding character, depth, and consistency from vintage to vintage. Wines are made by the Methode Champenoise, meaning the secondary fermentation (the ones that makes the bubbles) takes place in the bottle. The Anderson Valley is near the ocean, and in addition to good drainage, has warm days and cool nights, not unlike Champagne, France. This allows the grapes to mature slowly and fully. The Valley is often described as cool and fog shrouded. They use an "open lyre" trellis system which grows the vines on movable wires and allows more exposure to sunlight than other trellis systems. Arnaud Weyrich is the winemaker and has a Masters degree in Viticulture and Enology, did his internship at Roederer Estate after graduating in 1993, moved back to France afterwards and worked with Champagnes and other beverages for a large retail store before moving back to Roederer Estate in 2000 where he now manages the vineyards and the daily business. He even lives on the estate with his family. 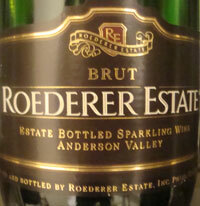 Roederer Estate Brut - This is their first wine which debuted in October 1988, and a wonderful value at the $20-$25+ price point depending on where you are buying it. See the tasting note below. It is about 60% Chardonnay and 40% Pinot Noir, aged for 2 years on its lees, and they make 80,000 cases a year. Fermentation is in stainless steel tanks with minimal malolactic fermentation if any. Roederer Estate Brut Rose - Their entry level Rose wine is 60% Pinot Noir and 40% Chardonnay like their Brut, however a small amount (approximately 5%) of Pinot Noir that has been made with extended skin contact making it red is added before the secondary fermentation. 10 to 20% oak aged reserve wines are used. They make about 5000 cases a year. Fermentation is in stainless steel tanks with zero malolactic fermentation. Roederer Estate L'Ermitage - Their vintage Tête de Cuvée, and a wonderful wine. Since its debut in 1989, it has been loved by the critics for obvious reasons (it rocks). In 2002 it's 52% Chardonnay and 48% Pinot Noir, and a little over 8000 cases were made. It's made only in great years from the best grapes. Roederer Estate L'Ermitage Rose - Their Rose version of the L'Ermitage. The first vintage was the 1999, and the second and current as of this writing (in 2012) the 2003. Less than a thousand cases are produced. Light yellow, very fine bubbles. The nose is lemon-lime, pear, and a bit of earthy minerality as it warms. The palate has tropical fruits and is smooth with good balancing acidity. It has a touch of orange which grows as it airs. As it warms some apple enters into the picture. A very pleasant California sparkling wine.